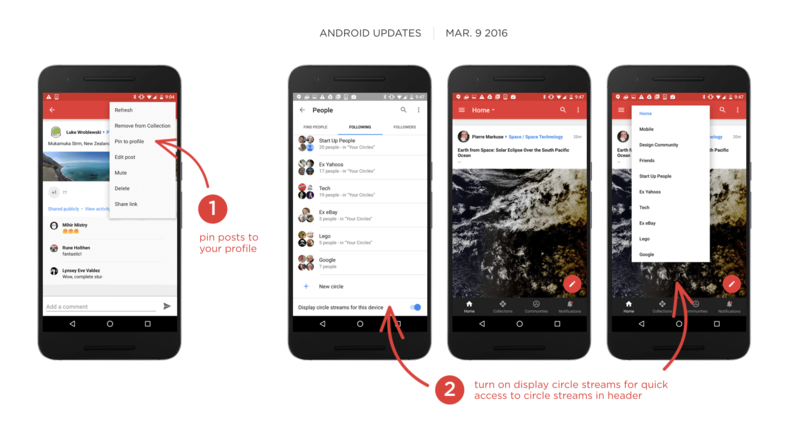 The evolution of Google+ marches on and thanks to Google’s Luke Wroblewski, the details of the update to the Android app for the social & community site are now available. The update has already started rolling to the Google Play Store so if you haven’t received the update yet, you will over the next few days. The updated version you are looking for is 7.4.0 and it will be available for both Android phones and tablets. As he usually does, Luke outlines what has been addressed from a bug perspective as well as what is new in this release. The ability to pin posts on your profile is actually a feature that was there for a little while, disappeared and now is making a return. This would allow you, for example, to pin a post about an upcoming event to your profile so that anyone who visits it will see it first at the top of the display. If you have not tried out the Display Circle Streams yet, give it a go. This is a great way to streamline your feed to just a particular circle you have setup (like co-workers or blogs you follow) to make reading a bit quicker and less cluttered. Think of it like Twitter Lists only a lot more refined.